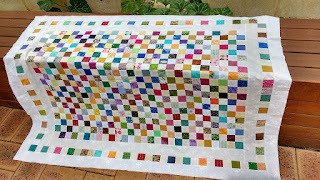 I know it's not quilted yet, that fun is still to come, but for now I'm celebrating a flimsy finish. This was a leader/ender project that seemed to grow quite quickly as I was doing other things. Then of course I wanted to complete the floating border, so it became the focus. Its amazing what scraps can do! In the interests of full disclosure, here is the back complete with all the seams and I've pressed most of them open - makes for a flatter surface when I come to quilt it which I hope will be soon. I think it's about number 5 of my to do list. Already 5 on the list to do and its still only January! I think I'd best make sure I do those before I add any more. This will be another baby quilt, I think that makes the third I have in the wings just waiting for the births to happen. Its good to be prepared. I like the size of these projects and feel a sense of satisfaction when I complete them. Plus they make a great gift. Beautiful! 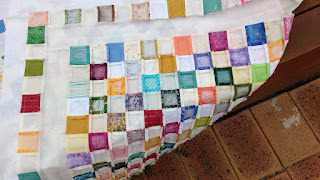 Love postage stamp quilts! And your colours are so wonderful and varied. Congratulations on your finish. Thanks Pam, colours just as they happened along! Hi Glinda, Thanks, yes I think I may make another. These squares started at 2" raw. I may do 2 half next time. Amazing organization to have 3 put aside ready to give away! I also smile at how it started as a leader/ender and then became the focus! HI Sandra, having quilts on hand is a first for me, but good to have. LOVE this cheerful finish! I also try to keep a couple baby quilts on hand, they are so fun to quilt up:) Thanks for linking with One Monthly Goal! Thanks Heidi, looking forward to what's achieved over the next 11 months!